Cervical pain is pain that occurs in the cervical spine. Seven small vertebrae make up the cervical area of your spine, which has the greatest amount of mobility and flexibility in the spine. Your neck can bend forward and backward, tilt from side to side, and turn or rotate to the right and left. Your spinal cord and spinal nerves at the cervical spine level send signals for sensation and movement through your shoulders and arms down to your hands and fingers. 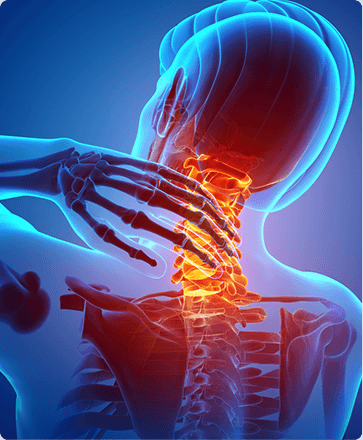 Neck pain is often accompanied by shoulder pain and is commonly caused by bone or joint abnormalities, poor posture, trauma, disease, nerve compression, and muscle spasms or strains. It may be described as muscle tightness or muscle spasms, which are sometimes accompanied by decreased mobility in the neck and pain from holding the head in one place for too long. Neck pain should be evaluated by a physician as it can sometimes be a symptom of a larger problem. It can also be chronic, or last longer than several weeks or months. In this case, the pain is usually due to spinal or nerve damage. While neck pain can limit mobility and affect your quality of life, we have many beneficial treatments for neck pain. Medications or physical therapy are most often used to treat neck pain. Over-the-counter medications like ibuprofen or acetaminophen may help relieve pain though your doctor may prescribe stronger pain medication. Physical therapy, which involves specialized stretches or exercises, has proven to be very effective in relieving neck pain. If nerves are causing your pain, steroid injections may be injected directly into the nerve itself. In the most severe cases, surgery may be needed to correct nerve or spinal issues. The first step in pain management is to locate the cause or source of your cervical pain. When treating neck pain, it’s helpful to keep a log of when the pain occurs, where it occurs and the severity of the pain you are experiencing. Be sure to include a rating of your pain from 0-10, with 10 being the worst, and if anything makes the pain worse or better. Rating your neck pain is a good way for your doctor to understand the severity of pain you’re experiencing. You should seek immediate medical attention if you have neck pain accompanied by headache, weakness, tingling or numbness, or if it spreads to another part of the body. Pain can have a negative effect on both your physical health and state of mind, but the right pain management treatments can get you moving and active again, leading to a happier, healthier life. To schedule a consultation with one of our pain management doctors, please call Chicagoland Pain Management in Bolingbrook, IL at (630) 312-4505 or in Hinsdale, IL at (630) 856-6825 (Hinsdale, IL) or use our convenient online appointment request form.